Free 3×01 Review: Sprouting Dive Start! And we’re back! The boys of Iwatobi have returned, and I couldn’t be more excited. “Sprouting Dive Start!” picks up early in Haru’s first year at university as he heads to his first swim practice – and then first tournament – of his college career…and runs into some old friends. It’s been a bit since Take Your Marks, so the biggest part of “Sprouting Dive Start!” is that we’ve jumped ahead in everyone’s stories. There is very little setup, so if you haven’t seen Take Your Marks, I’d recommend checking that out before you tackle season 3. 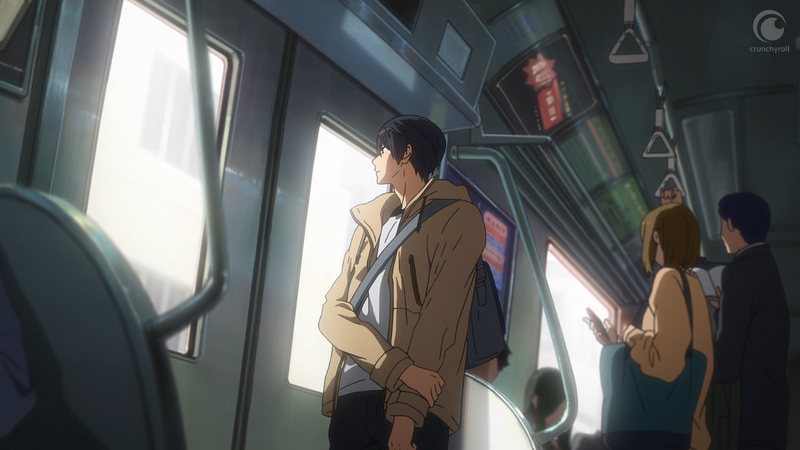 On the way to his first college swim practice, Haru runs into Asahi and they reconnect. It’s nice to see some expression on Haru’s face! Also it turns out both Mikoshiba the elder and Kisumi attend the same university. So many characters from the various incarnations of Free!, I can barely contain myself! Plus all of the new ones! Aside from Haru and Asahi’s teammates, we’ve already met the newest members of the Iwatobi Swim Club, as well as various family members. With so many new characters, you wonder how they’ll juggle storylines. As most of the action seems to be centered around Tokyo, we’ll probably spend the most time there, only occasionally looking in on Rin in Australia and the Iwatobi and Samezuka boys. They still managed to work in Rin and Haru’s rivalry, even though they’re on different continents. That split-screen race that wasn’t really a race was quality, and I got a little choked up at the end when Haru glanced over at the empty lane beside him. I’m not sure how much season 3 will cover, but you have to hope that these two are able to race again – for real – soon. “Sprouting Dive Start!” also reminded you of the other rivalries – and hinted that Ikuya has become a beast since he’s been MIA. 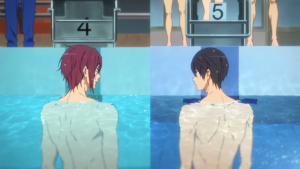 A lot of the promotional material seemed to emphasize that the relationship between Haru and Ikuya – and whatever happened in middle school – will be a focus this season. The fact that Hiyori called Haru and Asahi poor imitations of Ikuya…sparks are going to fly on Free!. Honestly, the most unbelievable thing to me was how animated Haru was in Kisumi’s presence. 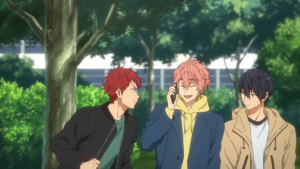 But it was great to see Haru, Makoto, Kisumi, and Asahi hanging out together. As we get further into the season, I hope we don’t lose little moments like that. And with a new season comes a new OP and ED! The OP for Dive to the Future is “Heading to Over” by OLDCODEX and it’s such a great slice of life sequence that highlights all of the characters. The ED is “Gold Evolution” by Style Five and is completely ridiculous and I love it so much. Everyone in formal wear? The dance sequence at the end? Magic. All in all, “Sprouting Dive Start!” is a great start for season 3, and coming back to this show feels like meeting up with old friends. I can’t wait to see what else is in store for my boys!